Leaving a gym can be hard. There are multiple reasons to leave a gym and even if you are leaving for a bad reason, there will be positive outcomes. You may want to leave because of the coaches, teammates, or maybe you’re moving out of state. There are so many reasons to stay in a gym, but if you want to leave, then here are some tips for when looking for a new gym. When looking for a new gym, every family will have their own preferences. You will probably look if the gym has a USAG Affiliation, the gyms competitive history, their setup, coaching philosophies, workout times, and what other people have said about the gym. If you want your gymnast to eventually be a college gymnast then you want to be 100% that you are going to a gym that has USAG Affiliation. Also, the gym must be under USAG for them to be able to host gymnastics meets. It will make your life easier if you are at a USAG Affiliated gym. If a gym you are looking at is not a USAG Affiliate then they may not be a competitive gym. Now, if you are looking for a recreational gym then that is fine, but if you are looking for a competitive gym, make sure it is a USAG Affiliate gym before signing up. In order to be successful in the sport of gymnastics, you have to compete well. Knowing a gym’s competitive history will help you see if you want to join their program or not. Let’s get honest, if you want your gymnast to win, then you will need to go to a gym that is known for their winning. It is okay if you are not looking for that, but if you are serious about your child and their career then it is helpful to be at a successful gym. There are two ways to look at a gym’s set up. You will want to go to a gym that has an organized facility. All parents love to watch their children so going to a gym that has a good viewing area is important. Pay attention to how the mats and equipment are set up in the gym. Look to see if it seems safe. 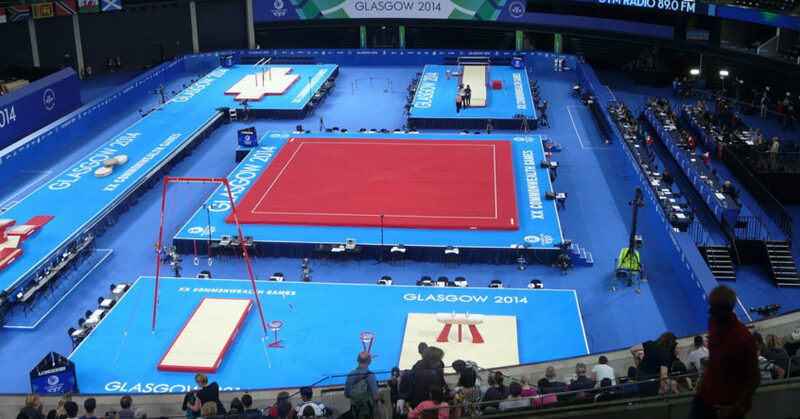 Incorrect placement of mats can be dangerous to a gymnast and cause injury. Having a locker room really is not essential to a gym, but having one helps your gymnast. They can keep their belongings there and not have to worry about them getting stolen or lost. Another aspect to look into before choosing a gym is how their program is set up. You are going to want to make sure that the gym is organized with how it runs its’ business. You will want to choose a gym that is professional and up to date with their system. Going to a gym that has their stuff together will make it easier for them to work with you if problems were to come up. Probably the absolute, most important aspect to choosing a gym is the gyms coaching philosophies. You are going to want to make sure that you choose a gym that has the right philosophies for your gymnast. If you want a nice, easy, laid-back gym then you want to make sure the coaches are not too strict or mean before choosing a gym. Or vise versa, if you want a gym that will be strict and hard on your gymnast then you will want to find that gym. It all comes down to what your preference is for your gymnast. Some gyms will be known as harder gyms, or easier gyms. You will have to decide which gym will be the best for your child. Read Also: Are you sure you need to switch gyms? You are going to want to choose a gym that works out with your schedule. Some gyms will have homeschool programs and workout in the middle of the day or in the morning. Some gyms will only workout at night. A gyms workout time is very important to you because if you cannot get your gymnast to a practice then they will not improve in their career. A gym’s reputation may be one of the most important aspects when deciding to go to it or not. If that gym is known to not do well in competitions, or to have mean coaches, or to not be organized, then going to that gym may not be the best option. You are going to want to put your child in a gym that is the best for them. If you are looking at a gym and you only hear positive comments about it, then it may be smart to try that gym out. Having a good reputation is something you will want to look into when deciding a new gym for your child. If there is a brand new gym opening in your city then that might be a reason for you to switch gyms. Gyms close and open all of the time. For example, let’s say that a new gym opened and your gymnast’s favorite coach was moving to that gym? That might be an incentive for you to switch gyms. If you want to stay with a certain coach or coaches then that may require moving to a new gym. It all comes down to what you think is the best for your gymnast.